Martha’s story inspired my interest in the history of recovery not only by revealing that this outcome of illness was thought to be possible in early modern England, but by showing that descriptions of getting better have the potential to shine light into practically every corner of life in the past. In times of health, people were often too busy to remark on such things as breakfast routines and bodily sensation; in severe sickness, they were usually too unwell to be able to do so. But, the transformation from sickness to health propelled all the normally unnoticed facets of human existence to the forefront of people’s minds and personal writings. What an exciting prospect for the social historian! Posset was a thick liquid food made from warm milk, ale, sugar, and spices; it was given to patients to restore strength after illness, and may have been the “food” taken by Martha Hatfield during her convalescence. 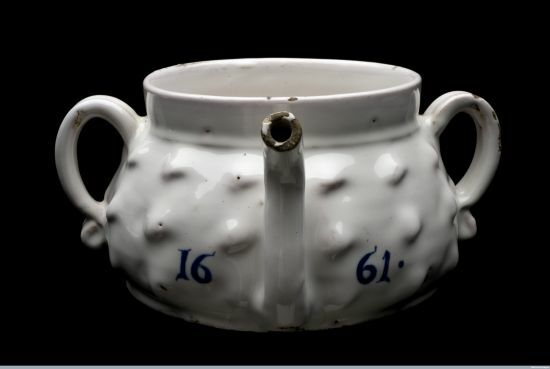 Image credit: Posset pot, London, probably 1661. Science Museum, London. CC BY 4.0 via Wellcome Collection. For patients like Martha, recovery was a “happie motion” from anguish to elation, a trajectory marked and measured by a number of key milestones, such as sleeping through the night, eating solid foods, and standing unaided. At the heart of this experience was contrast. Robert Harris, a clergyman from Oxfordshire, described getting better as a transformation from “sicknesse to health…from sadnesse to mirth, from paine to ease, from prison to libertie, from death to life.” Patients enjoyed the blissful ease of abated pain, and cherished the freedom and sociability that came after a spell in the “lonely prison” of the sickchamber. They took pleasure in being able to carry out simple actions, which prior to illness would have generated no comment. Claver Morris, a Dorset doctor, recorded that after his fever in 1720, “I got up…and put on everything excepting my shoose, & completely dress’d myself in 2 minutes, by my wife[’]s watch!” Recovery was also a deeply spiritual experience, since it was believed to be ordained by God. Ultimately, the clue to the experience of recovery lies in the word itself: the verb “recover” means to re-possess. Patients re-possessed not just their physical faculties and ease, but all the other things they loved about life of which they had been deprived during sickness, such as visiting friends and strolling in the fields. Despite these downsides, the overwhelming impression is that recovery was the cause of great jubilation for patients and their families. I hope this finding will rebalance and brighten our overall perception of early modern health, thereby encouraging what the emotions scholar Darrin McMahon has called a “positive turn” in the discipline of history at large. Featured image credit: Model sickchamber: The young patient is feeling better, and sits up to take her first meal. Courtesy of Hannah Newton, with her thanks to Kathryn and John Jitan for constructing the house. Hannah Newton is a historian of early modern medicine, emotion, and childhood at the University of Reading. 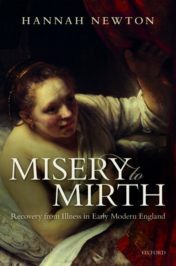 She is the author of The Sick Child in Early Modern England, 1580-1720, which won the European Association for the History of Medicine and Health Book Prize, and Misery to Mirth: Recovery from Illness in Early Modern England.